CrabmeatMedia:Sonic1 MD US SonicJam manual.pdf, called Ganigani (ガニガニ) or Crab-crab in the Japanese manualMedia:Sonic1 MD JP manual.pdf, is a Badnik crab that walks slowly sideways and is always vulnerable to attack, but has little bombs it shoots out of its claws when it pauses. This Badnik is found in multiple zones in both the Sega Mega Drive and Sega Game Gear versions of the original Sonic the Hedgehog. A Crabmeat also makes a short appearance in the Sonic the Hedgehog anime movie. The Crabmeat appears from the brushes and Sonic directs him to pinch Old Man Owl to snap him out of crying. A real crab heavily resembling Crabmeat appears in Sonic X episode, On Sight! The Sunken Ship in Southern Sea. It makes an appearance in the spinoff game Sonic & Sega All-Stars Racing as an obstacle for the courses of Seaside Hill. A remote controlled version of this particular Crabmeat can be purchased as an "Avatar Prop" for your Avatar exclusively on Xbox 360 marketplace. In Sonic Colors, it appears with a redesign in Aquarium Park and gets upgraded to fire homing rockets instead of bombs. Crabmeat also appears in HD Sonic Generations in the Classic and Modern iterations of Green Hill, as well as very occasionally in the Classic iteration of Planet Wisp. 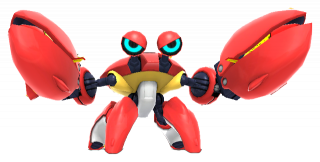 This version of Crabmeat appears to be the same exact one that appeared in Sonic Colors. If the player manages to get hit successfully by a Crabmeat, it will fall to the ground and laugh hysterically in accomplishment. In Sonic Lost World, Crabmeats can be found in Tropical Coast, and unlike their previous appearances they must be kicked to flip them over and make them vulnerable to attack. Trying to attack them without kicking them first will cause them to counter Sonic's attack with a punch. Some Crabmeats will fire missiles like their Colors and Generations counterparts. Crabmeat in Sonic the Hedgehog (16-bit). Crabmeat in Sonic the Hedgehog (8-bit). Crabmeat in Sonic & Sega All-Stars Racing. A remote controlled Crabmeat as an Avatar Prop for Xbox 360. Crabmeat in Sonic the Hedgehog (anime). A real crab that heavily resembles Crabmeat in Sonic X.
Crabmeat's original artwork from Sonic the Hedgehog (16-bit).